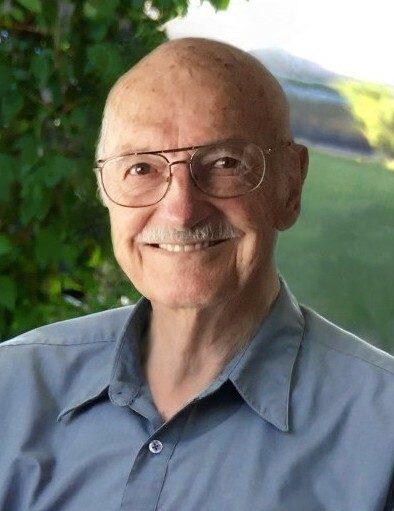 Franz Mark Johansen, of Provo, Utah, passed away on August 23, 2018. Born May 10, 1928 in Huntsville, Utah, to Mark Colton Johansen and Seneth Chloe Allen, he spent his youth working on his family farm and enjoying the hills and river bottoms of the Ogden Valley. Not long after WWII, he served an LDS mission in the British Isles. On December 1, 1950, he married Ruth Aldous in the Salt Lake LDS Temple. After fulfilling his military service in the U.S. Army as a tank trainer, he studied art at Brigham Young University, graduating in 1955. He joined the BYU Art Department in 1956, where he taught and later served as Chair, retiring in 1989. Franz was a prominent LDS artist, influential through both his work and the many students he taught. He pursued graduate studies at the California School of Arts and Crafts, Illinois Institute of Technology in Chicago, the Academie de la Grande Chaumiere in Paris, and the University of Miami. Although he experimented with a variety of artistic mediums, he was best known for his sculpture, which was often informed by LDS theology. His art pieces include large bas reliefs on the LDS Church History Museum in Salt Lake City, and the Harold B. Library and Joseph Smith buildings at BYU. He has permanent sculptures displayed in the BYU Sculpture Garden, the Springville Art Museum, the LDS Church History Museum, the LDS Conference Center, and various historical sites in the U.S.
Franz served in a variety of callings in the LDS Church, particularly enjoying the opportunities he had to teach others. Throughout his life, he retained a connection to the outdoors that he developed as a youth. He loved camping with his family, growing things in his yard, exploring the remote places of the West, snorkeling in the Sea of Cortez, and chasing “The Gold Nugget” in the Yukon. In 2001 His wife, Ruth, passed away. In 2011, Franz married Josie Morris, whom he had known in Brighton, England as a missionary. The marriage was solemnized in the Provo LDS Temple. He is survived by his wife, Josie, his children, Lynn (Robert) Bell, Salt Lake City; Kevin (Jacki), Salem, Utah; David (Julie), Payson, Utah; Nathan (Betsy), Provo; Shawn (Michelle), Rexburg, Idaho; Mathew (Andrea), Wollongong, Australia; and Lisa (John) Tucker, Lindon, Utah. He has 33 grandchildren and 48 great-grandchildren. Special thank-you to Intermountain Homecare and Hospice and especially Nurse Lisa for the diligent, professional, compassionate and positive care she gave to Dad. Her cheery voice always brought a smile to his face and her concise explanations and instructions brought peace and confidence to the rest of us. Thank-you. Funeral services will be held on Tuesday, August 28, 2018 at 11 a.m. at the LDS church on 4056 Timpview Drive, Provo. A viewing will be held at the church from 9:30-10:30 AM, prior to services at 11 AM. Interment will be in the Eastlawn Memorial Cemetery in Provo, Utah.